While doing some suspension work on a collector car, we had to replace the pitman arm seal in the steering box. Since seals come in standard sizes, we were able to find the proper seal at a local auto parts store for only a few dollars. After using a pitman arm puller to drop the arm, the old seal was pried out using dental picks. We then installed a new seal using a seal driver. The entire repair went very smoothly so we were surprised to find an empty steering box when we recently did maintenance on the same car. We filled the steering box with fresh gear lubricant and kept an eye on it for a few days. Sure enough, it was leaking — but the leak was not coming from the pitman arm seal. It was coming from the adjusting nut on the front of the steering box. In a worst case scenario that could mean a complete teardown of the steering gear. Fortunately, we had a set of old tune-up and lubrication sheets from a Shell gas station. These were printed on large cards like those that used to be kept in a steel storage box at each Shell station. They told mechanics the parts and specs needed to do regular maintenance on cars of the '50s and '60s. Each card contains a chassis lubrication chart with a drawing of a car chassis and arrows that indicated points to be lubed and the best Shell lubricants to use. The arrow pointing towards the steering box indicated that gear lube (such as we had used) was the proper lubricant. However, it also noted "Shell Retinax A should be used if there is any sign of leakage." This gave us hope that we might be able to avoid an expensive teardown of the steering box. It didn't take us long to boot up the computer and surf the Internet to see if Shell Retinax A was still available today. We discovered that the "A" suffix has been changed, but Retinax is available in CMX and MDX formulations. It is a multipurpose lithium complex grease with moly that is used for construction, mining and agricultural equipment. A technical sheet points up that these greases consist of a lithium complex soap thickened, multipurpose extreme-pressure grease compounded with a highly refined paraffinic oil base. These greases are characterized by a high dropping point and are formulated with a special additive package to provide excellent rust protection and resistance to water washout. A special tackifier helps keep them in place on high-speed equipment and in wet conditions. They have been engineered with good pumpability characteristics, making them ideal for centralized lubrication systems. Retinax CMX 1 is especially suitable for applications where very cold weather or long feed lines are involved. The presence of moly in these greases provides an extra measure of protection in shock loading situations, which are common in construction and agricultural usage. During heavy shock loading, the lubricant film between metal surfaces can be temporarily ruptured or squeezed out. 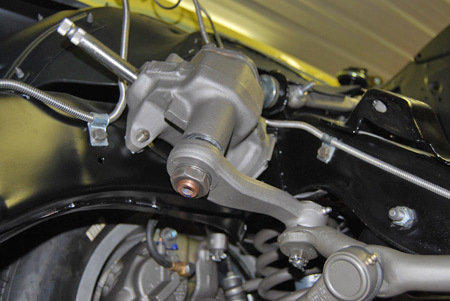 By using a moly grease, a film remains to prevent metal-to-metal contact. Moly is also valuable in a dirty environment or when proper lubrication intervals are not followed. Retinax greases are used for virtually all points of grease lubrication on dozers, scrapers, earthmovers, cranes, backhoes, shovels, rollers, tractors, combines and cotton pickers. They are handled by Shell dealers who service this market. Caterpillar dealers also sell a similar Multipurpose Grease product. The characteristics of these greases are well-suited to use in steering boxes on old cars which often do not work well when other greases are used. A Model A Ford website mentioned another Shell product called Valvata J460. This is a steam cylinder oil that a Model A owner was advised to use in a leaky steering box. He had disassembled the steering box and replaced a leather gasket, but found that it still leaked from the area where the frame and sector housing met. A member of a Model A club in Africa recommended Valvata J460. Shell Retinax grease completely stopped a leak that developed in this '69 Camaro steering box after new seals had been installed. Apparently, this oil had also been mentioned in one Model A restoration book. It has a fairly high viscosity and is also available in an even higher viscosity called Valvata J680. Shell's technical department told the Model A owner that the "J" prefix designates gear oils. The poster said the oil had a sticky, stringy feel like STP oil additive. The Valvata J460 stopped the leak. If you discover a leaky steering box that can't be fixed by replacing the pitman arm seal, you might want to consider using Shell Retinax greases or Valvata J 460 steam cylinder oil as a possible fix. Technical information on both products is available by calling 1-800-840-5737 or visiting www.shell-lubricants.com.